Waveriders are candidate shapes for various types of hypersonic aircraft designs. 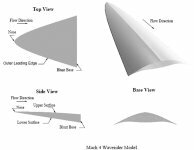 A waverider is a shape designed from a known supersonic or hypersonic flow field, such as flow past a right circular cone. The waverider is designed such that the bow shock is attached along the outer leading edge at the design point. The lower surface is designed by using the known flow field to trace streamlines from the leading edge to the trailing edge. A waverider is uniquely defined by a leading edge definition and a specific set of freestream conditions. The upper surface may be designed as either a freestream surface or as a slight expansion surface to provide an additional contribution to lift. The shape is generally optimized for either maximum lift-to-drag ratio or minimum drag at the design point. The attached shock wave creates an efficient compression lifting surface with no flow spillage from the lower surface to the upper surface at the design point. Because of this characteristic, the predicted lift-to-drag ratios of waveriders are higher than those for conventional hypersonic vehicle concepts. The uniformity of the lower surface flow field and the absence of crossflow make the waverider an ideal candidate for scramjet propulsion system integration. A unique phenomenon of high mach number flight is the effect of shock interaction. The nose of the vehicle would create a conical shock around the body; such a shock results in significant pressure drag and must be overcome by propulsion systems. If the lower portion of the vehicle could keep the outer wing tips even slightly attached to the bottom portion of the conical shock, then the resulting total pressure on the bottom of the wing would be much higher than the top. This is the basic idea behind a waverider. 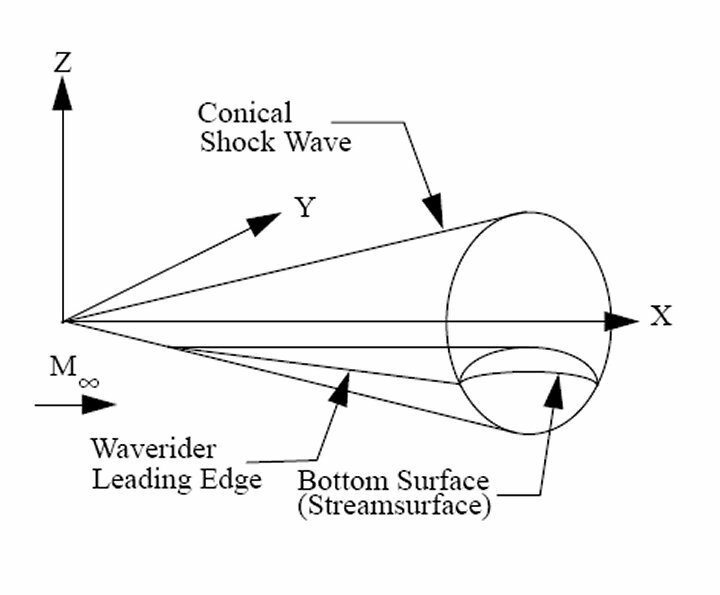 The effect of the waverider can be modeled mathematically. If the bottom of the vehicle follows the same pattern as the stream lines of air, then it can be drawn as attached to the shock. The waverider, which matches the flow (streamsurface), attaches to the shock and obtains a large lift-to-drag ratio (L/D), which enables much further range when compared to other hypersonic bodies. 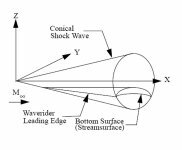 Although getting a shock wave to attach perfectly is impossible in reality, the initial shock angle can be made as oblique as possible, reducing pressure drag. When combined with the high aerodynamic heating of hypersonic flight, the waverider provides an aerothermodynamically configured vehicle. A high speed vehicle could perform missions such as: cruise missile carrier, high altitude reconnaissance platform, long range strike aircraft, and long range transport. Aircraft derived from shapes based on the waverider theory offer one approach to providing the designer with a configuration which shows great potential when used for the previously listed missions. 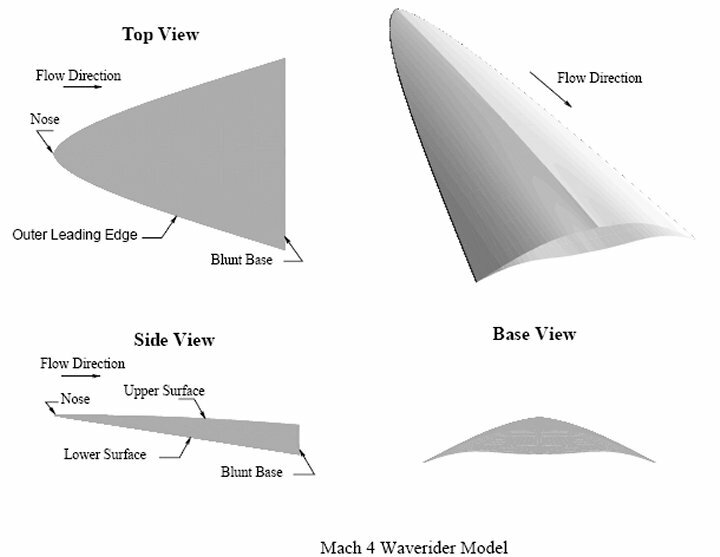 The waverider shape is attractive for achieving high L/D at a design flight point. The waverider shape also offers potential advantages in propulsion/airframe integration for airbreathing hypersonic vehicles. The aerodynamic attractiveness of this type of configuration has generated much interest with aircraft designers. Practical design considerations, however, require that a waverider-derived aircraft have a cockpit, engines, and other drag producing necessities. Aftbody closure is also a significant challenge due to the thick bases present on waverider shapes. Studies have shown that the aerodynamic and stability and control characteristics of proposed hypersonic aircraft during take-off, initial climb, and approach phases of flight will greatly influence the ultimate vehicle design. Previous criticisms of waveriders have been resolved in studies in the early 1990s, leading to renewed interest in their use for hypersonic vehicle designs. One criticism is that early design techniques used only inviscid methods which produced shapes with large surface areas that resulted in large skin-friction drag. The lift-to-drag ratios obtained experimentally were poor compared to predictions. Current design codes include an estimate for skin-friction drag in the optimization process. This improvement allows the optimization routine to minimize wetted surface area and provide more accurate estimates for aerodynamic performance. The class of vehicles designed using this method is called viscous-optimized waveriders. A second concern associated with waveriders is that their off-design performance may be poor even though on-design performance is excellent. However, experimental and computational studies have shown that waveriders which demonstrate acceptable off-design performance can be designed. Additionally, optimization routines can include various volumetric constraints which allow for the design of shapes with improved volumetric efficiencies and packaging characteristics while accepting a minimum penalty in aerodynamic performance. Previous computational studies have validated design methods and predicted waverider flow-field properties accurately.